Strauss Zelnick, chairman and CEO of Take-Two Interactive Software, tells Jim Cramer about his company's newest titles, and the NBA 2K eLeague. For an "Executive Decision" segment, Cramer sat down with Strauss Zelnick, chairman and CEO of Take-Two Interactive Software Inc. (TTWO - Get Report) , which just posted a blowout 35-cents-a-share earnings beat that sent the stock up 10%. 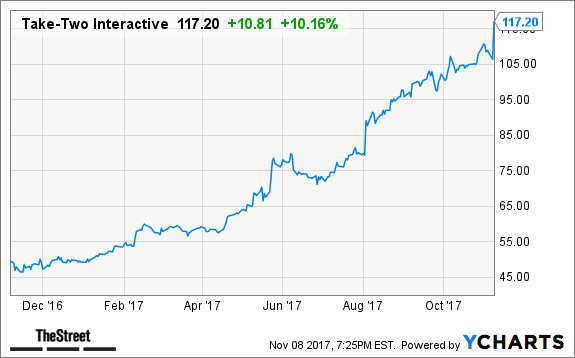 Year-to-date, shares of Take-Two are up over 115%. Zelnick said that Take-Two's install base is growing and his company is seeing more users that are playing for more hours every day. But even with that growth, there's still a lot more room to grow, he added. Zelnick was bullish on one of their newest titles, L.A. Noire, which is pushing the envelope for what realistic, cinematic games can accomplish. He said for some of their titles, like basketball, if you squint your eyes, you can't tell the difference between the game and a live sporting event. Further blurring the lines between gaming and reality will be Take-Two's NBA 2K eLeague, which will consist of gaming teams owned by actual NBA franchises. The league will soon start drafting players and is set to have its debut season in 2018. Cramer said despite this stock's incredible move, there is indeed more room to run. On Real Money, Cramer says Kraft Heinz Co. (KHC - Get Report) is scanning the shelves for a company to buy. That may be the only way it can achieve growth. Get more on his insights with a free trial subscription to Real Money. Cramer and the AAP team are taking a hard look at Starbucks (SBUX - Get Report) long-term growth target. Find out what they're telling their investment club members and get in on the conversation with a free trial subscription to Action Alerts PLUS. At the time of publication, Cramer's Action Alerts PLUS had a position in SBUX.